Musical.ly, the video app popular with teenagers, was acquired in November by Chinese news aggregation giant TouTiao for a whopping sum in the ballpark of $800 million. What does TouTiao plan to do with its expensive purchase? According to a planning document provided to Gizmodo, one of Musical.ly’s initiatives under new management may be a riff on HQ Trivia, codenamed Project F.
Live, interactive video content—if HQ’s audience, which regularly peaks at over 1 million for a single game, is any indication—might cure what ails Musical.ly. 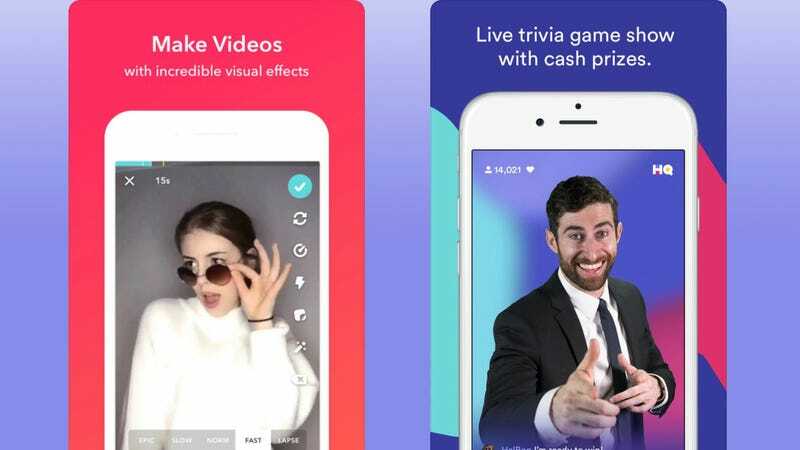 As internally described, Project F would replicate almost all the core features of HQ Trivia wholesale: a twice per day vertical video, semi-improvisational script delivered by a personable host, and the ability to win money or prizes. While Musical.ly would be far from the first company cashing in on HQ’s success—copycat The Q comes to mind—it would be the first attempting to foist the format onto an existing, sizable audience. The most recent schedule reviewed by Gizmodo estimated Project F will launch on February 2nd. What&apos;s Up With This Teen Making a Musical.ly While His Grandfather Is Ostensibly Dying?